Happy Friday! We’ve enjoyed delving deeper into some of the beautiful images on display in Shaping a Modern Identity: Portraits from the Joseph and Charlotte Lichtenberg Collection during our 5-day celebration of FotoWeekDC. The last photograph we’re featuring is Lydia Panas‘s Figs, which also happens to be the most recent photograph on display in the installation. 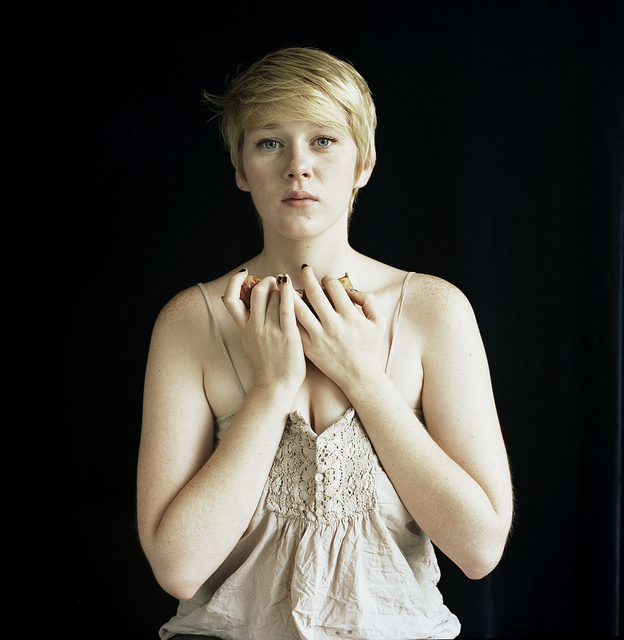 For Panas – a contemporary portrait photographer working in southeastern Pennsylvania – figs provide both a title for her 2010 work as well as a unique means for exploring the internal through portraiture. In her series Falling From Grace… from which this work comes, the subjects are placed in front of a black background and provided with various foods which they are instructed to hold in their hands. Panas believes that people’s extremities often reveal what a face may conceal. Her work is drawn from the idea that the things we try to hide still reveal themselves somehow. This seems most evident in the Falling from Grace… series, where the expressions are particularly unclear but the hands and positioning of food objects seem to give the viewer cues as to the sitter’s emotional state. In Figs, the young woman sits with her hands holding several figs close to her chest. Her light skin and hair provide a stark contrast with the black background. Panas cites Old Dutch portraiture and early religious works, where the faces are set against a dark black background, as an important influence. The black background allows the viewer to zoom in directly on the sitter, her pose, and her expression. The woman’s expression is searching, slightly tentative, and her hands carefully cradle the figs and almost completely obscure them from the viewer’s sight, as if she is protecting them. There is an underlying intimacy between the subject and photographer in this and all the other photographs in the series, as if Panas has been able to extract each sitter’s vulnerability, breaking through the unreliability of facial expressions and using their subconscious movements and poses with the food objects to reveal their true emotions and thoughts. It’s a two-for-Thursday here on the blog, as we enter day four in our celebration of FotoWeekDC. Both of the images we’re featuring today from Shaping a Modern Identity: Portraits from the Joseph and Charlotte Lichtenberg Collection stem from photographers who worked for the Farm Security Administration, documenting the federal government’s efforts to restore rural communities affected by the Great Depression. The similarities between the two images, however, end there. Walker Evans, Landowner, Moundville, AL, 1936. Gelatin silver print. The Phillips Collection, Washington, D.C., The Joseph and Charlotte Lichtenberg Collection, Partial and promised gift of Joseph and Charlotte Lichtenberg, 2005. Walker Evans’s photographs went beyond the intentions of the FSA’s agenda, as he sought to capture the essence of the true consequences of the Depression on ordinary American life. In the summer of 1936, Evans took a leave from the FSA to work independently with writer James Agee to capture the people and scenery of Moundville, Alabama. 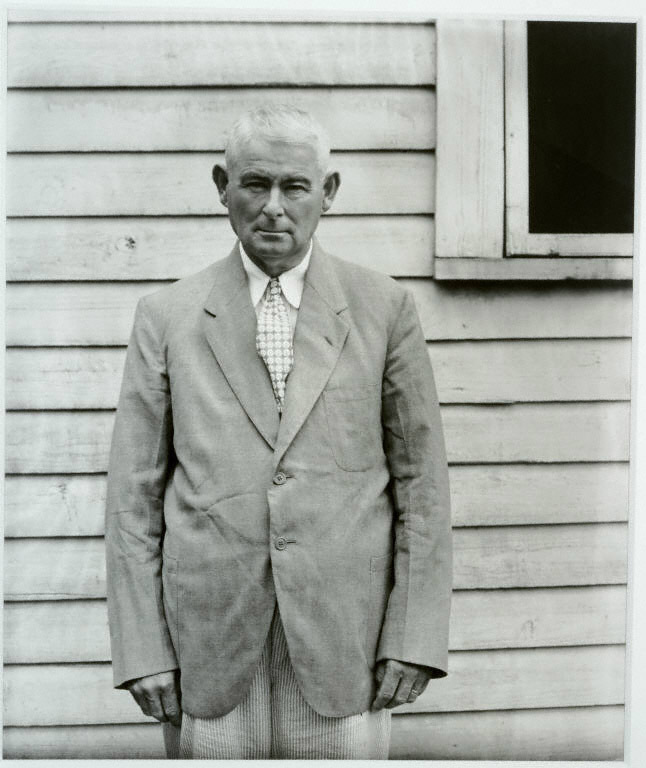 In his portrait Landowner, Moundville, AL we see a man standing in front of the siding of a building, looking straight into the camera in an expressionless manner, his arms casually at his sides. Evans portrays him as an archetype of those affected by the Depression: his wrinkled suit, the lack of emotion, the low contrast between the man and the background, all suggest the everyday struggles of any man in the subject’s situation. In this depiction, Evans isolates the subject from the glorification which often accompanies portraiture (as seen in Serrano’s depiction of “Sir Leonard”) and approaches his subject as the everyman. He does little to explore him emotionally but rather presents a frank image with somber undertones of the impending economic circumstances of the time. Jack Delano, Bootleg Coal Miner near Pottsville, PA, 1938. Gelatin silver print. Joseph and Charlotte Lichtenberg Collection. On the other hand, Jack Delano sought to personally connect with his subject matter, carefully composing his images to highlight what sets his subject matter apart, individualizing them. “To do justice to the subject has always been my main concern,” he wrote in his autobiography published in 1997. “Light, color, texture and so on are, to me, important only as they contribute to the honest portrayal of what is in front of the camera, not as ends in themselves.” In 1938, Delano spent a month living amongst and photographing the men at a mine in eastern Pennsylvania and due to this constant proximity with his subject matter, his photographs demonstrate a special connection with and compassion for the miners. 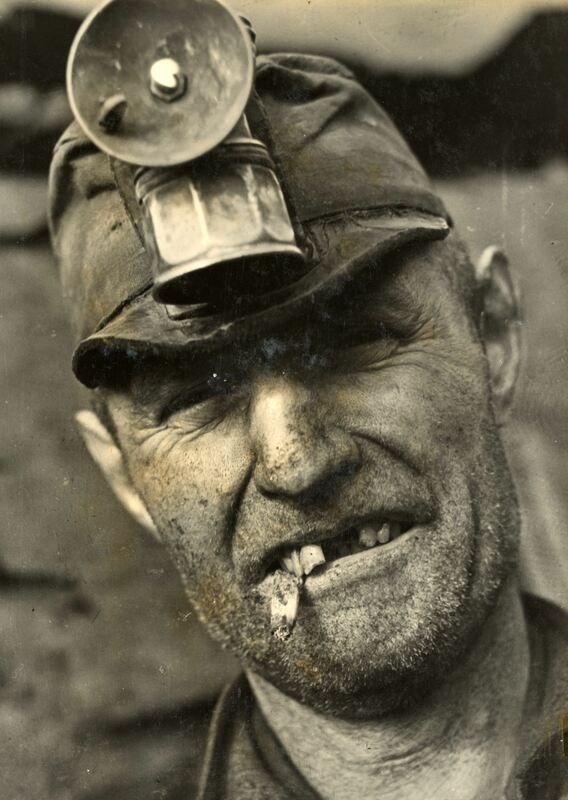 In Bootleg Coal Miner near Pottsville, PA, the subject appears scruffy and worn, his mouth is open revealing missing teeth, and a cigarette rests on his lower lip. The photographer has cropped the man’s face tightly within the frame as the miner extends diagonally across the composition. This is no everyman; he has a definite identity. While Evans’ subject in Landowner seems to blend into the background and thus becomes more of an idea or archetype than an actual person, Delano’s miner confronts the viewer head-on, declaring himself an individual, albeit one of many struggling to make ends meet in tough economic times. On day three of our celebration of FotoWeekDC, we look at the enigmatically beautiful photography of artist Francesca Woodman on display in Shaping a Modern Identity: Portraits from the Joseph and Charlotte Lichtenberg Collection. Francesca Woodman first began her experiments with photography at the age of 15. Two years later, as a student at Rhode Island School of Design, she continued her exploration of black and white photography and film until she took her own life at the young age of 22. Despite her short lifespan, Woodman was prolific, creating over 10,000 negatives in just 7 years. Francesca Woodman, Providence, Rhode Island, 1975-76, Gelatin silver print. Courtesy George and Betty Woodman. Woodman’s Providence, Rhode Island is one of only two self-portraits in the installation. While Harry Callahan’s portrait of his wife Eleanor strove to achieve formal autonomy without an introspective look into his subject matter, Providence is an exploration of Woodman’s inner psyche. She perpetually looked to herself as the subject of her own works, using her body to convey her inner emotions and thoughts. Her admiration for the fashion photographer Deborah Turbeville shows in the lushly shadowed and textured scenes Woodman shot in an abandoned house in Providence, Rhode Island, where her own figure often blurs into a ghostly, dematerialized form. In Providence, Woodman navigates both past and present; she appears in prairie-style dress and shoots with medium-format film reminiscent of the turn-of-the-century, yet her disposition is urgent, contemporary. 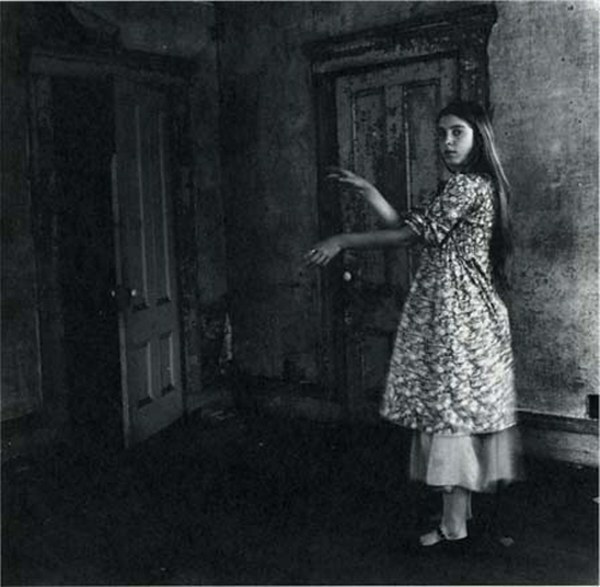 The camera captures her in the dilapidated interior in the midst of movement (seen in the blurred lines of the hem of her dress and her arms) with her arms eerily extended towards the doorway as she stares out at the viewer. The open door suggests a way out of this transient space, but it is unclear if the artist is willing to leave and whether or not her arms are beckoning the door open or closed. This early photograph demonstrates the performative quality of Woodman’s photo and video oeuvre in which the artist engages with her space, using her body to explore the environment around her as well as her internal state.